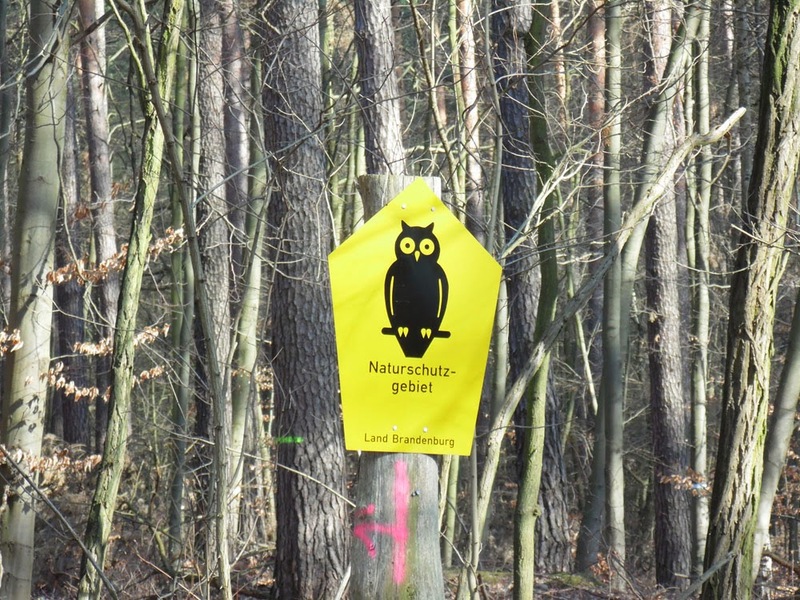 das Blog: Cycling in Brandenburg can be Fläming Dangerous! First day of Spring and we went for a 60km cycle along the Fläming-Skate, which is the name for a number of inline-skating and cycle paths that can be found in the Fläming region South-West of Berlin. 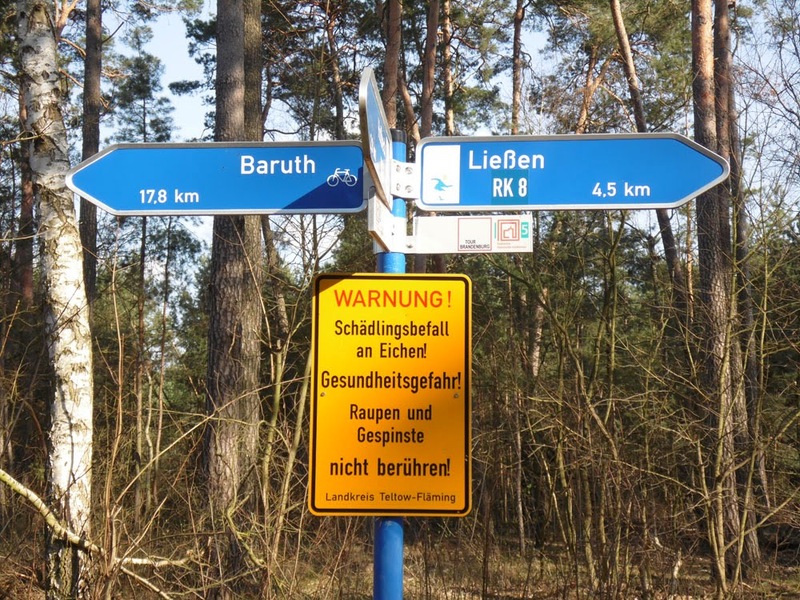 We began at Jüterbog and ended up at Baruth, both serviced by regional trains, so a Brandenburg train ticket and a pair of Fahrrad Tageskarten (bike day tickets) saw us right. It was an invigorating cycle to begin Spring with, though we had to battle with strong cross-winds most of the way around. 'Fläming' might look to English speakers like it is on fire, but is actually pronounced more like 'Flemming', and is so-named for the large number of Flemish folk who settled in the area in mediaeval times. Even knowing this, it was still a shock to see a petrol station named 'Fläming Tank' on the outskirts of Baruth! 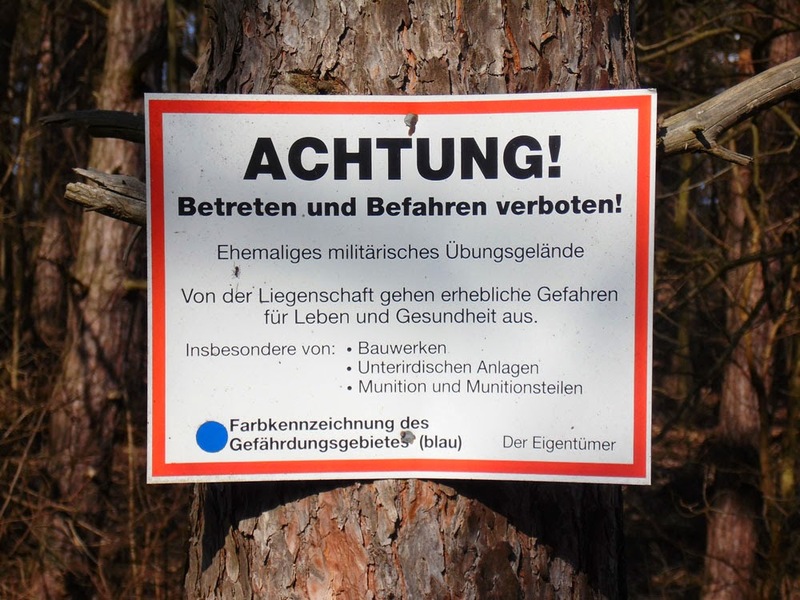 This is telling you not to trespass, as it is a former military exercise area, and is warning you of danger to life and health from such things as construction work, underground complexes and ... gulp ... live ammunition. That's getting a bit scary, but heck, the Cold War has been over a long time now, there can't be anything life-threatening left can there? Stop! 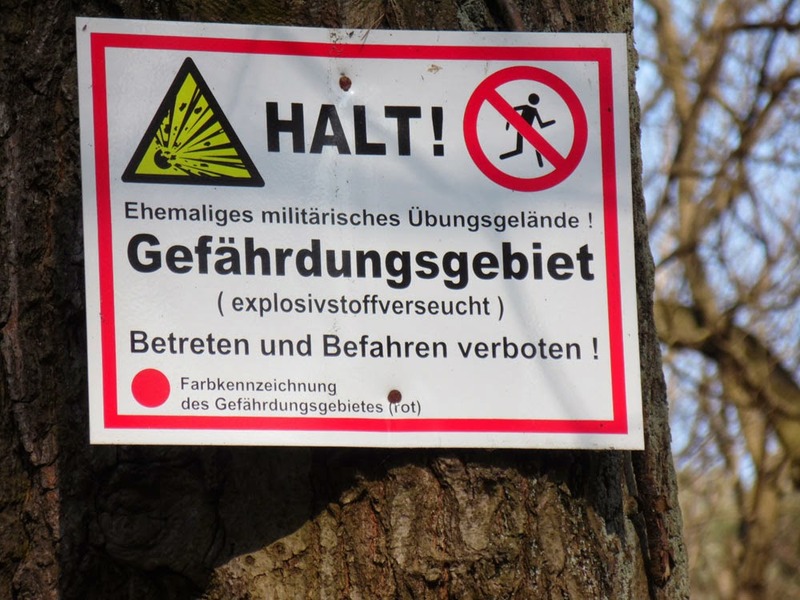 Danger Zone (explosives contamination). Righty-oh, got the message. If it's not hordes of itchy caterpillars about to leap onto your head out of trees, it's old Cold War ordnance ready to explode under-foot. Time to get those pedals spinning and get out of here! At least the wildlife gains something out of warning signs keeping people away; the whole of the former military exercise area is now a nature protection reserve!